I’m linking up with both What I Wore Wednesday and Work it Wednesday– so if you have time, be sure to check out these other great sites. 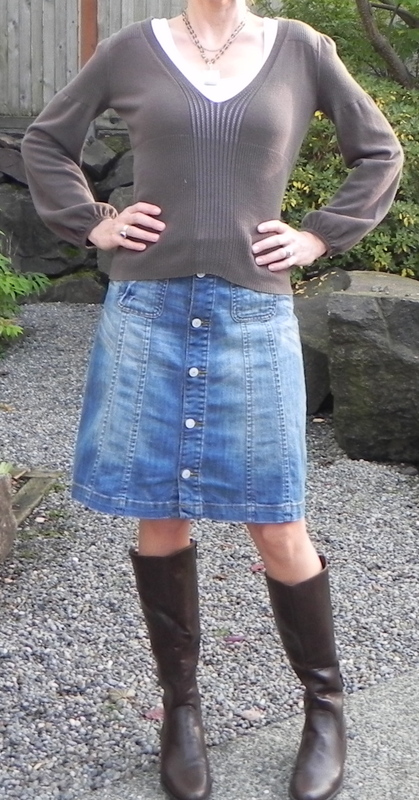 Today I am showing my denim skirt worn 3 ways. Speaking of 3- I’ve mentioned this before but I like following the rule of 3. By this I mean I try to always have 3 items in the upper half of my outfit. In my first look I’ve paired it with a black t shirt, silver necklace and my furry vest, affectionately named ‘the dog’ as seen here. I like this look because it’s edgy, yet doesn’t seem to far out of my comfort zone. On the right is my next look- where I’ve paired the skirt with this brown sweater. To follow the rule of 3 I have a tank under the sweater and a necklace. This sweater has a lot of interest because of the pattern down the middle and the sleeves. Paired with brown boots- it’s a classic and safe outfit. Lastly I’m showing a weekend look. I’ve paired it with a long sleeve pink t shirt over a white tank and then layered my white vest over for warmth. I’m wearing casual tennis like shoes- perfect for running errands or standing on the sidelines. This skirt is a good alternative to jeans. This sweater would look cute belted too. I like the weekend look a lot, and that fur fest is so fun! Love faux fur vests. I’m always at a loss as to what to wear it with though. So gonna try your vest with the skirt look. Love it. Thanks! This is from Marshalls!